Bratislava was for centuries an important center of Jewish life. Jewish presence in the medieval city was regulated by the municipal charter granted to Bratislava by King Andrew III Arpád, in 1291. One section of the document stipulated that the Jews had right to reside within the city walls, elect their own mayor and pay taxes directly to the King. Later, the Jews were expelled from the city on several occasions, the last time in 1526. In 1599, they returned to Bratislava, but not to the town proper. Invited by Count Pálffy, they settled in a narrow zone between the castle hill and the city fortifications. The so-called Judengasse, a part of the area controlled by the Castle, remained the only place Jews were allowed to live until 1840. In the first half of the nineteenth century, Bratislava became an important center of Jewish learning. The Chatam Sofer established a famous yeshiva (rabbinic school), and at the same time his opponents in the Community opened a modern Jewish primary school. Later, there were two Jewish communities in Bratislava, the Orthodox and Neolog, each of them with its own large synagogue. Most Bratislava Jews were killed the Holocaust, but most of the Jewish built heritage in the city was destroyed after the War. The Orthodox synagogue was demolished in 1961 and the rest of the Judengasse, along with the Neolog synagogue, was razed in 1968, when the SNP Bridge was constructed. Today, there is a small but active Jewish community in the city. The only remaining synagogue in Bratislava is located on Heydukova Street, not far from the historic city center. It was constructed in 1923-1926, decades after restrictions on Jewish residence were lifted, enabling them to move out of the Judengasse district and settle throughout the city. The synagogue exterior has a towerless, seven-pillared colonnade facing the street. The interior includes a large sanctuary in which modern steel-and-concrete construction and contemporary Cubist details are combined with historicist elements, such as the arcade of the women’s gallery, a metallic bimah, and the ark. The architecture fulfils traditional religious requirements, such as separation of men and women and placement of the bimah in the center, but it also features modern facilities: Cloak-rooms, toilets, and an array of additional rooms for study and social gatherings cluster along the western façade of the building. The synagogue still serves as an active Jewish house of worship. 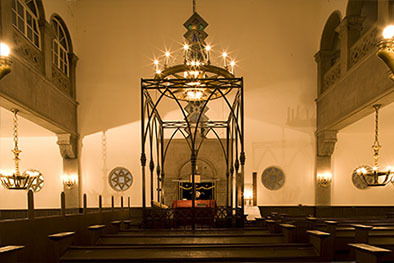 The Bratislava Jewish Community Museum is located in the former women´s gallery of the synagogue.